Risk Management | Fancom Connects Ltd. The management of these competing areas of focus is known as risk management. As an example, a project’s budget may be met by specifying and installing equipment that does not live up to the performance speciﬁcation set out by the design team. This action will however impact negatively on the quality of the project. Likewise, the addition of additional tasks along the way in response to a client request or an unforeseen circumstance, while entirely possible, may impact the project time lines and budget. These variances from expectation, their identiﬁcation, recording and mitigation to the satisfaction of the project sponsor is the collective task of Risk Management. 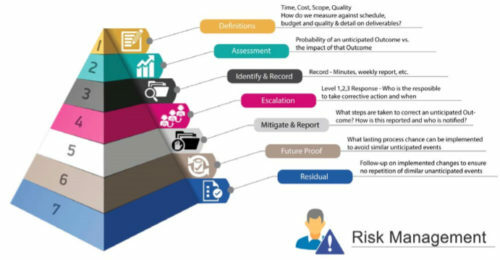 Risk management involves several speciﬁc, purpose driven steps as noted in the graphic. As project managers for the installation and integration for communications and electronic systems Fancom is responsible to deliver of all aspects of the project on time, within scope, on budget and to a quality standard as set out in written speciﬁcations.